Hanashiro Chomo was born in 1869 and at an early age began training with the man many consider to be the greatest of all Tote masters, Matsumura Sokon (1809-1901), well known as "Bushi" Matsumura. Matsumura was quite an old man at the time and Hanashiro was primarily a student of one of Matsumura's senior students, Itosu Anko (1830-1915). Itosu shaped modern karate as much as any other person in history and spearheaded a movement to bring Tote into the Okinawan school system around the turn of the century. Hanashiro remained with Itosu, and acted as an assistant instructor for him up until his death in 1915. From early in the 20th century, Hanashiro taught gymnastics at a junior high school in Shuri (Okinawa's capital) which gave him an excellent opportunity to aid Itosu in the introduction of Tote into the school system. In the 1920's, Hanashiro Chomo was one of the most highly regarded karate masters in Okinawa, this was acknowledged even by other masters. Despite this, information about him is rare in English language texts, and is usually scattered somewhat in existing references. It is difficult to talk about the life of Hanashiro Chomo without also talking about another of Itosu's senior students and assistants, Yabu Kentsu (1863-1937), also originally a student of Matsumura. Yabu was probably most famous for his many challenge matches, all without a single loss. These two shared many common experiences and have remarkably similar karate careers. Both were noted as having exceptional physiques in the 1891 Japanese army draft's medical exams. They were both pioneers in instructing karate in the school system in the first decade of the 20th century, and also taught Tote in military schools. Both were also present at the famous Oct. 25th, 1936 meeting of Okinawan Masters. At this meeting, attended by the greatest masters of the time (including O-Sensei), the name "karate do" was officially adopted over "Tote Jutsu". A photo of members of the meeting can be found on Page 7 of the Old Canadian Chito Ryu Technical Manual and many other karate history books, Yabu and Hanashiro are in the middle of the bottom row, O-Sensei is 2nd from the left in the top row. An interesting story that demonstrates the association of Hanashiro and his dojo-mate Yabu well into their lives comes from Nagamine Shoshin (1907-1998), founder of Matsubayashi Ryu (a well known branch of shorin ryu), and author of "The Essence of Okinawan Karate-do". While studying at the Metropolitan Police Station in Tokyo in 1936, Nagamine met with Hanashiro Chomo and Kentsu Yabu who warned him that the karate katas in Tokyo had changed considerably and that Nagamine should take pains to keep the katas he taught in their original forms. I find this interesting, as Nagamine met with both masters at the same time, 50 years after they were dojo mates at Bushi Matsumura's dojo. Obviously the two were very close. Hanashiro was not only a pioneer in the school system, he pioneered the use of the word "karate". In his August 1905 publication, "Karate Shoshu Hen" (AKA "Karate Kumite"), we can see the first known use of the modern kanji. See below for the change in the kanji characters from the original "Tote" (China hand) to the modern "Kara-te" (Empty hand). Hanashiro was one of the primary instructors for an organization formed in the early 1920's in Okinawa called the Ryukyu Tote Kenkyukai (Okinawan Tote Research Club). The club was an expansion of an earlier organization formed in 1918 by Miyagi Chojun, a famous Tote expert and founder of Goju Ryu. Originally the organization was meant to continue the teachings of Itosu Anko, Higashionna Kanryo and Aragaki Seisho, the last generation of masters who had died between 1915 and 1918, leaving a great void (NOTE: Higashionna and Aragaki were both teachers of O-Sensei). Within this club, Okinawa's greatest masters hung around together taught Tote and exchanged ideas. 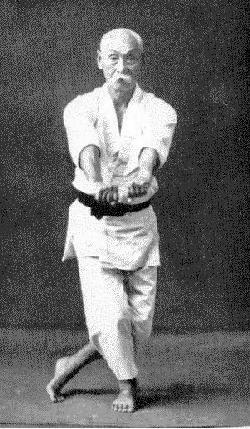 Hanashiro Chomo wasn't the only teacher, others included Miyagi Chojun (the original organizer), Mabuni Kenwa (founder of Shito Ryu), Motobu Choyu (one of O-Sensei Chitose's teachers, his teachings eventually became Motobu Ryu, a martial art called Te, precursor to Okinawan Tote). Unfortunately, the Kenkyukai disbanded in the late 1920's, members stated that the demands of their students was the reason. The face of karate today would be a different one if the Kenkyukai had remained in existence. Hanashiro Chomo had a few famous students, of particular note are Nakamura Shigeru (1892/95-1969 of Okinawan Kempo), O-Sensei Chitose (1898-1984, founder Chito Ryu), Nakama Chozo (1899-1982, of Kobayashi Ryu), Shimabukuro Zenryo (1904-1969, founder of Seibukan Shorin Ryu) and Kinjo Hiroshi (1919-, Patrick McCarthy's current teacher and famous karate historian). From discussions with Patrick McCarthy, it is believed that Hanashiro received the kata Ryusan from a Chinese tea merchant and White Crane gungfu practitioner named Gokenki. Gokenki worked for the Eiko Chako Tea Company and taught White Crane in Okinawa between 1912 and his death in 1940. Gokenki was an occasional member of the 1920's Kenkyukai, mentioned earlier, and associated with many of Okinawa's great masters during this time. 1945 was a horrific year for karate and for Okinawa in general. The "Battle of Okinawa" was fought and Okinawa was relentlessly pounded by U.S. artillery and occupied by U.S. troops as island where karate originated was caught between the United States and Japan near the end of the Second World War. Best estimates coming from Okinawa after the war state that approximately 60,000 civilians were killed during the 82 days of fighting. The time after the battle was no less forgiving and many died of starvation and disease, including many karate masters and their students. Hanashiro Chomo was one of the unfortunate victims of this time. "Bible of Karate - Bubishi", Charles E. Tuttle, fourth printing 1997. Translated with commentary by Patrick McCarthy. Bishop, Mark: "Okinawan Karate - Teachers, Styles and Secret Techniques", A&C Black Ltd. London, 1989. Higashi, Shane: "Chito Ryu Karate", Canadian Chito Ryu Karate Do Association, 1984. Sells, John: "Unante, the Secrets of Karate", John Sells and Hawley Publications, 1996.